As many people are now aware, new plans have been submitted for the re-development for Victoria House up at the North Cheam crossroads. When I say 'new plans', actually the proposal looks almost the same as the previous plan, which was withdrawn without explanation earlier this year. The main difference seems to be the retail units having been made a bit bigger. So we're finally going to lose the eyesore that has blighted the crossroads for years. Yes that's one good argument. However how is the new plan going to affect the area? 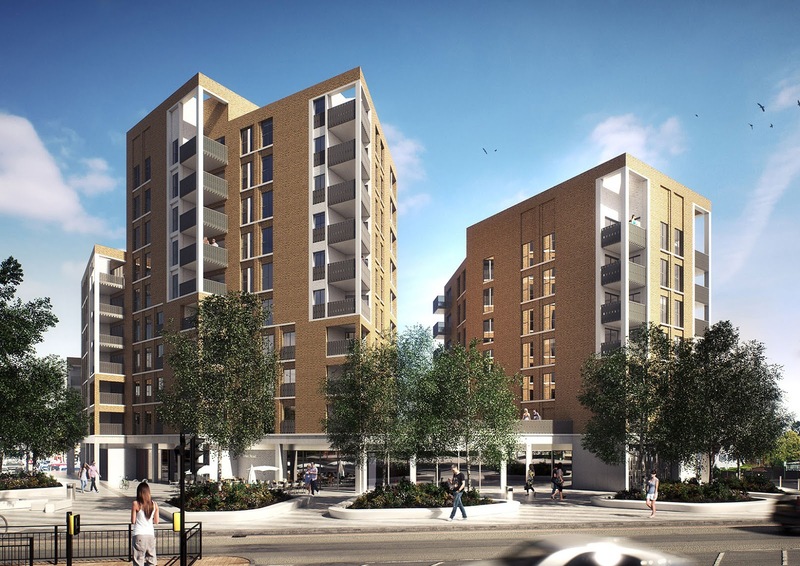 The new plan - shown above right, is effectively a group of tower blocks - almost the ugliest possible design, universally known as the greatest attractor of antisocial behaviour. It doesn't fit in with the art deco design of the buildings on the other three corners of the cross roads or other buildings in the area. Perhaps we could 'get used' to this design on our doorstep - all 10 storeys of it. But could we also get used to the over-spill of cars? This building is to have 90 residential units, a mix of 1, 2 and 3 bed-roomed affairs. How many car parking spaces would you think are needed to cater for 90 such flats? If you think fifty or less you probably don't use local public transport very much. But guess what - the answer is indeed 50! In fact it is closer to 45 as five of those spaces are for the retail units. Now to compensate there are around 150 bicycle parking spaces. I seem to remember another recent planning application in Green Lane where we were told that 'everyone would arrive on bicycles' and so we needn't worry about the chronic shortage of parking spaces. Perhaps this plan has been put together by the same people? Just one question - are they deluded about the number of people who own/use cars (perhaps vs those who only cycle) or is this their attempt to socially engineer a little portion of North Cheam into a anti-car paradise? So what does it take for people to want to ditch the car? Not very far away there are indeed areas where few people own cars. Areas where I would quite happy live without a vehicle. This area is called Central London. The reason we don't need cars there is a) the plethora of excellent public transport to get you to nearly anywhere local quickly, and b) nearly every type of shop imaginable within walking distance. The relative convenience of public transport has all been nicely mapped out and corresponds to a number of 'PTAL values' (I promise not to get any more technical than this). There are nine values basically going from 0 (being almost nonexistent public transport) up to 6b - being transport so convenient you'd prefer it to using a car. 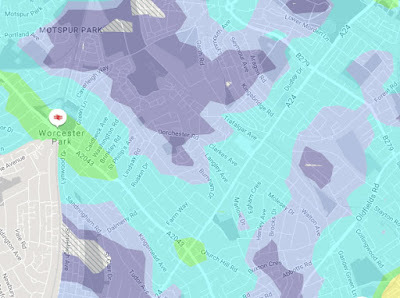 (See the full London PTAL map here). The whole of central London is either PTAL 6a or 6b - indicating the most convenient public transport possible. Sections of Worcester Park are 0 (worst possible) most of the area is 1a (really awful) with areas mostly around main bus routes being around 2 (not quite as awful). There happen to be a couple of small islands in the area of PTAL 3 (which on an exam might almost scrape a pass). Victoria House happens to sit just inside the smallest of these. I don't think you need to be a genius to work out that the best way to get people to use public transport is to increase the convenience of public transport to the point where it is preferable to car use. Deliberately discouraging car use by limiting car parking spaces to around half of what is needed without offering a genuine alternative is not 'visionary'. It's just stupid and will result in people looking for other places to put their cars. Those other places will be the very few spaces around North Cheam that still exist in side streets and around the shops. That means that a) other people who live in the area will have even less space for their own cars, and b) the people who currently shop in North Cheam and use their car to get there will soon realise that trying to park in North Cheam is a pointless exercise and will go elsewhere, leading to fewer customers in the shops there. This means that instead of reinvigorating North Cheam, this development will be an additional (if not final) nail in it's coffin. A counter argument might be the parking available in the Sainsburys car park - and I'd agree that more needs to be done to let the public know that they can easily get to the North Cheam shops from here but it's not like parking just at the shop you want to visit. And it's existence hasn't been enough to make North Cheam a vibrant shopping area. Making the parking situation even worse isn't going to somehow fix the problem. Now it's easy to say that this plan is better than the eyesore currently on the site (you may agree or disagree with this statement). However the point is, it's not merely one or the other. We have already seen a far better plan put forward for this area. On the left here is the proposal put forward by Stonegate Homes. I personally knocked on doors with a petition in favour of this development (so this is not just a knee-jerk reaction against any local development.) Yes, this was still a tall development, and bigger than we would have liked, but it was generally in keeping with local art-deco design and crucially it had enough parking space for residents plus extra space for shoppers during the day and then for visitors in the evening. Also it wasn't a group of tower blocks. In short it would have improved the area, not diminished it. For these reasons two local residents' associations have joined forces to fight against this latest proposal. Chapra RA (Church Hill and Priory Road Residents' Association) and the WPRA (Worcester Park Residents' Association), which I currently chair, have organised a leaflet which we are delivering to homes near the site and also a petition. As this is a new proposal, all previous comments/objections (or letters of support) are no longer relevant and only comments specifically based on this new proposal will be taken into account by the planning department. 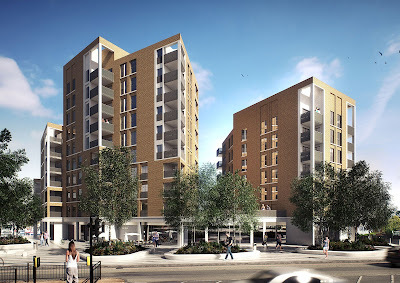 So if you would like to object, comment on, or even write in support of the proposal, the planning application number is A2016/75951 which can be accessed on www.sutton.gov.uk, or by using the following direct link. Remember to quote planning number A2016/75951. The petition is being held in Steve's Card Shop on the North West corner of the crossroads - opposite Victoria House if you'd like to go in and sign it. We also have a small number on volunteers out delivering leaflets and also door knocking to gather petition signatures. Please contact me (Simon Densley) via the WPRA - wpra96@hotmail.com if you'd like to join them and I'll get you some leaflets or petition sheets and allocate you some roads to do. We need to be quick though - the deadline is at the beginning of January. We hope that with two local residents' associations working together, our combined voices will be heard loud and clear. Yes we want the existing building removed, but we want it replaced with something that will enhance the quality of the local area - not something that in 10 years time might be as hated as much as the exiting Victoria House is now. So please make your voice heard by emailing or writing to Sutton's planning department and please feel free to get in touch to either deliver leaflets or to knock on doors to get petition signatures. And yes if you completely disagree with me about all this, that's fine - you can write in to support the application. 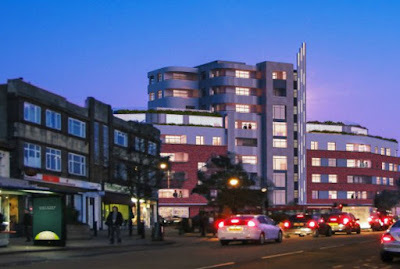 Hopefully though we'll get the sort of development we need at the North Cheam cross roads. We've waited many years for a proper development. I'd say a couple more years to ensure we get the right one will be worth the wait in the long run - especially when we're looking back at what we did about this particular proposal.